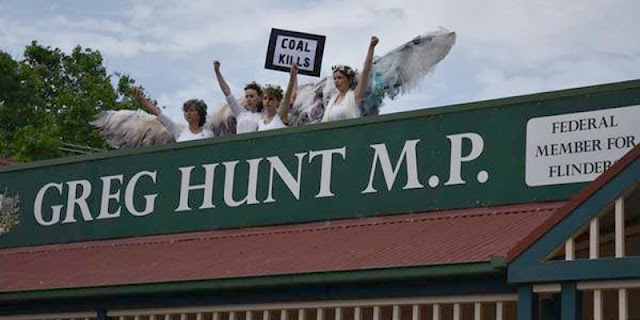 Melbourne's climate Guardian Angels have descended on top of Environment Minister Greg Hunt's electoral office in Hastings in a rooftop protest at the re-approval of the Adani Carmichael coal mine in Queensland's Galilee basin. Update: after a full day and evening on top of the roof, the Climate Angels have now safely descended. No arrests. The original Minister's approval for the Carmichael Coal mine had to be set aside when challenged by the Mackay Conservation Group that the Minister had ignored and not taken into account two threatened species. The Minister, Greg Hunt, has subsequently drawn up an approval notice with conditions and sent a media release on Carmichael Coal Mine and Rail Infrastructure project on 15October, 2015. These conditions include establishing offset habitat and $1 million of funding for research programs to improve conservation of threatened species in the Galilee Basin over 10 years. In a statement the Mackay Conservation Group said "Minister Hunt is sacrificing threatened species such as the Black Throated Finch and precious groundwater resources for the sake of a mine that simply does not stack up economically. The Black Throated Finch will be pushed to extinction if this mine goes ahead, and countless other species will suffer as precious groundwater springs are depleted of water by the Carmichael mine." A host of Climate Guardian Angels have descended on Minister for the Environment’s rooftop to protest his approval of the Carmichael coal mine. The project, proposed by Indian mining giant Adani will produce up to 60 million tonnes of coal for export a year, transported through the Abbot Point terminals which are located close to the Great Barrier Reef. As climate scientists are finding new evidence of accelerated global warming with methane plumes erupting from seabeds, and new modeling on ‘unstoppable’ Arctic sea ice melt with 30-100 cm seal level rises by 2100, this approval of this mine is grossly negligent towards future generations and their intergenerational right to a safe and just climate. The Carmichael mine has been declared ‘unbankable’ by the Queensland treasury, as the price of thermal coal slips to beneath $60 a tonne, widely considered in structural decline as the world moves towards renewable energy sources to combat the worst impacts of runaway climate change. 14 major global banks have refused to fund it. As the warmest year on record draws to a close, and in the lead up to the UN COP21 climate talks, the decision by the Australian government to further lock our economy into dirty polluting fossil fuels makes a mockery of the pitiful commitment we have made of a 26% cut in emission on 2005 levels by 2030. Climate Guardian co-convener Dr Liz Conor said, ‘to be actively expanding Australia’s coal export industry now is beyond irresponsible; it is staggeringly negligent. It will consign our children and theirs to a volatile, dangerous climate system, with far reaching repercussions for their lives. If Prime Minister Malcolm Turnbull and his Environment Minister Greg Hunt will not listen to the science on climate change — before leaders from the international community — we entreat them to heed the warnings of Guardian Angels. The Climate Guardians are travelling to Paris to hand deliver letters and artworks by Australian children to UN delegates since their own government is indifferent to their fears about their future in a volatile climate. "Let's get this straight. Australian politicians are allowing some of the richest Australian billionaires combined with Chinese and Indian power corporations to destroy the Great Barrier Reef, one of the natural wonders of the world and a World Heritage site. Political approval of mining the guts out of the coal rich Galilee basin in Central Queensland destroys sensitive ecosystems like the Bimblebox Nature Reserve containing threatened species, and is forecast to substantially lower the water table impacting rural communities and agricultural productivity with possible repercussions on flow in the Great Artesian basin aquifer." "In ignoring the impact of greenhouse gas emissions from burning the coal (presumably on the formalistic basis that consideration is an indirect rather than an explicit requirement under the Environment Protection and Biodiversity Conservation Act), the Federal Minister indicates his preparedness to completely disengage with global climate change imperatives. If we are to stay under 2℃ of warming, coal is an obsolete resource. The strategic issue for Australia (and the globe) is how to manage the termination of existing coal plants and accelerate the shift to lower carbon intensive energy sources." Knowing what we do about the imperatives of climate change, approving a vast new coal plant on the eve of the Paris climate change talks, in complete disregard of its significant greenhouse gas implications, is unethical and, at a global level, indefensible. Katherine Lake, a Research Associate at the Centre for Resources, Energy and Environmental Law at the University of Melbourne, pointed out the Federal Court setting aside the approval was on very limited groundsand did not deal with substantive aspects of the case, "While the mine itself is contentious on environmental and economic grounds, the Federal Court’s earlier decision was very narrow and did not consider the climate change consequences of the proposed mine, as requested by the Mackay Conservation Group." "...the climate change impacts of major developments are yet to be considered by the Australian courts" said Katherine Lake. Matthew Currell, Lecturer in Hydrogeology at the School of Environmental Engineering, RMIT University, highlighted that the Carmichael mine will involve the extraction of approximately 12 gigalitres (billion litres) of groundwater and the mine does not have the consent of the traditional indigenous owners of the region, who have expressed deep concerns over the impact the mine would have on the landscape in the Wangan and Jagalingou country. Adam Lucas, Lynette Molyneaux and Craig Froome all questioned the economic viability of developing the Carmichael mine given the current coal price, the amount of initial investment required (about $16 billion), the lack of financial support from 16 global investment banks, and the growing action to limit carbon emissions in the lead up to the UN Climate conference in Paris in December. The Climate Council released a brief statement on facebook that said: "Yesterday, the Turnbull government approved the Carmichael Coal Mine. Let's be clear about the impacts that this will have: if all of the Galilee Basin coal was burned it would release more than 1.3 times Australia's emissions per year. Opening up the Galilee Basin is incompatible with tackling climate change. Full stop." Climate Guardian's SOS to the world. Greg Hunt imperils our future with his approval of the #Carmichael #Adani Coal Mine. Setting off flares on his office rooftop.